Training is essential to the achievements of a business. Perhaps its most positive benefit is better employees. A company develops the potential of an employee, and part of the way a company encourages improvement is through training. Often, good training is just as important as a good benefits package for an employee. We at AKA Comp with with your company to make sure that your company develops an appropriate skill set required to meet your business objectives . Skills required for maintaining a specific career path or to general skills offered through continuing education, including the more general skills area of personal development. It is training to keep current with changing technology and practices in a profession or in the concept of lifelong learning. 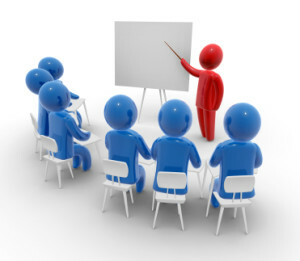 Example: Conduct workshops and seminars on topics relevant to the course or technology offered by an organization. Our IT Training team and work with you and provide the type of skill sets your organization requires . Instructional design is the practice of arranging media to help learners and teachers transfer knowledge most effectively. The process consists broadly of determining the current state of learner understanding, defining the end goal of instruction, and creating some media-based “intervention” to assist in the transition. Ideally the process is informed by pedagogically tested theories of learning and may take place in student-only, teacher-led or community-based settings. The outcome of this instruction may be directly observable and scientifically measured or completely hidden and assumed. Analyze – analyze learner characteristics, task to be learned, etc. Example: Design and develop training materials or revision of course curriculums.